I had been thinking the 7/8" torque tube (.035) would fit snuggly in a 1" bushing (.058) and that bushing would be welded to a bracket assembly which is secured to the floor. 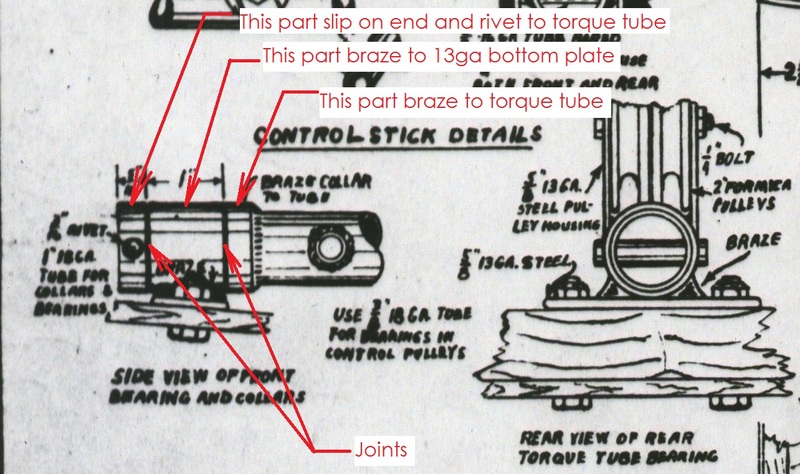 The plans, however, on the upper left area of sheet 4 show a collar is brazed to the torque tube. Is the torque tube supposed to rotate in a bushing/collar; or is the torque tube brazed to the bushing/collar and that part rotates in the bracket? (I did search the forum and looked at numerous photos, but nothing helps). The 1" diameter tube that fits over the 7/8" diameter torque tube is actually three pieces - slices of tube; 2 pieces approximately 5/16" long, and one piece 1" long. One of the narrow (5/16") pieces is slipped onto the torque tube, and brazed to it. This piece acts as a stop, to prevent the torque tube assembly from moving forward. The 1" long piece is brazed to a 13ga flat strip that will get anchored to the floor. And the third piece (5/16" long) is slipped onto the torque tube, with the other 2 pieces in place, and riveted to the torque tube, to act as a retainer. Wow Bill, thanks for the explanation and the graphic. That sure helps!